Why Did Yohan Cabaye End Up At Crystal Palace? Would you like Yohan Cabaye on your team? This must have been a question that floated around a few boardrooms in early summer and it seems that fewer decision makers put a tick in the “Yes” box than you might have thought. The Premier League is awash with cash these days and a player that cost Paris Saint Germain around £20m just 18 months ago and was available about half that tariff failed to rouse the interest of the top four, or even the top seven. So why not? Back in the January window of 2013-14, Cabaye left the Premier League after a storming half season that surely represented his best form. A comparative rarity in the league: a genuine two-way midfielder, capable of driving play forward and with a strong shot usually employed from range, he was also unafraid of putting in defensive work. In fact, in some research I did around that time, I could only find three other midfielders with his level of contribution, in regard defensive work married to attacking output: Ramsey- in his breakout season- and in a potentially intriguing hint for any Schweinsteiger deniers- the still contributing Lampard and Gerrard. At that time, he looked as though he could start in any Premier League midfield and enhance it. But the petrodollars landed and Mike Ashley cashed in and back to France he went. Whilst selling your best player at the absolute peak of his form seems like a stupid thing to do, and disregarding Newcastle’s annual spring malaise, a bid of the scale received combined with a recognition that he’d hit the high watermark made it arguably a smart move. Newcastle are smart, right? So, a cursory glance and we have a solid contributor who had the half season of his life. He and Tiote were the main volume passers in these Newcastle teams and both offered extensive defensive contribution. That last season, Cabaye, with slightly more license and an ability to roam took his shot and goal rate into the realm of a forward. But, and this is key, 75% of his shots were coming from range. Of the 16 non-penalty goals he scored in his time at Newcastle, ten of them were with his right foot and from outside the box. The four from 48 shots in 2013-14 was an extremely high rate, and was highly unlikely to sustain. The quality of performance seen- the kind that attracts a wealthy suitor’s eye- was built from goals and shots. His role in the PSG team, when picked, was clearly different to before. Given a world class array of attacking talent in front of him, rather than say, Shola Ameobi, the expectation on him wasn’t to drive forward and shoot, as he had at Newcastle but keep things ticking over. During his time at Newcastle, he averaged around 45 to 55 passes per 90 and lead the team in pass volume. At PSG, who were naturally dominant in their league in most metrics, this rocketed up to 75 to 85 passes per 90 but his attacking contribution fell in a hole. This seems like the motif of a player that has been confounded by two issues; team instructions and possibly his own inhibitions. Noting that his “key pass” rate halved during his sporadic PSG appearances will have done little to convince his coach or teammates of his importance. His shot rate returned to his pre-2013-14 Newcastle level; and understandably given his over-performance in long range conversion prior to his move, they stopped going in. There may well have been further issues causing problems here, but we’ve supposed enough for now. So, from being a first on a team-sheet key guy for Lille and then Newcastle, he became a bit part player for the French giants. He only completed 90 minutes three times in 2014-15 and got on the pitch for a mere 37% of available league minutes during his season and a half. Upon signing for Crystal Palace, plenty of people expressed surprise that a club of higher standing hadn’t attempted to secure his services. There was a definite bias at work here: many people will have their most recent memory of Cabaye as rampaging through the Premier League, fewer will have visualised him warming a Parisian bench and there are rational explanations for the move that extend beyond the obvious. 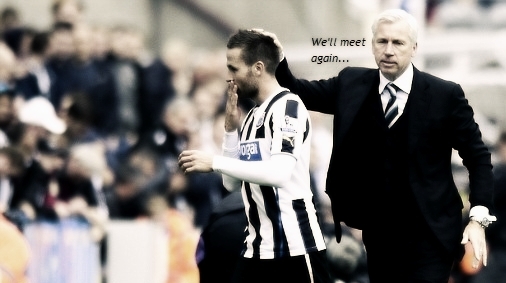 The straightforward re-coupling of Cabaye with Pardew is a simple hook to hang the transfer on. Pardew supervised the best form of his career, managed him for two and half seasons and will no doubt know how to incorporate him into the team he is fashioning at Palace. I’d imagine playing alongside a Tiote-like defensive midfielder in Jedinak would be the plan and once more, Cabaye returns to be the big fish in a smaller pond. Arsenal: recent policy involves world stars (Ozil, Sanchez) and fewer older players. Ramsey also occupies a similar role. Man Utd: the proposed Schweinsteiger signing shows the tier of player that they are looking at. There is a difference between winning French trophies and World and European titles. Southampton: again represent the opposite to Cabaye in transfer policy. There simply weren’t viable options for a sporadically involved 29 year old player beyond the mid-tier of the Premier League. In a sense he has returned to his natural level. It gives Palace a significant upgrade in their midfield, at least for a year or two, and is another representation of the increased spending power in the Premier League, moreso that they would meet his wage demands. Linked to that, of all the middle to lower tier, Palace seem most keen to spend to their limits. Good luck Yohan Cabaye. Maybe you will star once more in a side that is built to allow you to shine?